I’m accustomed to my wife stealing French fries off my plate, but stealing my design samples? Well, that’s a first! My wife, Melissa Morgan, is an interior designer in Orange County, CA. Her aesthetic is very modern with clean lines. 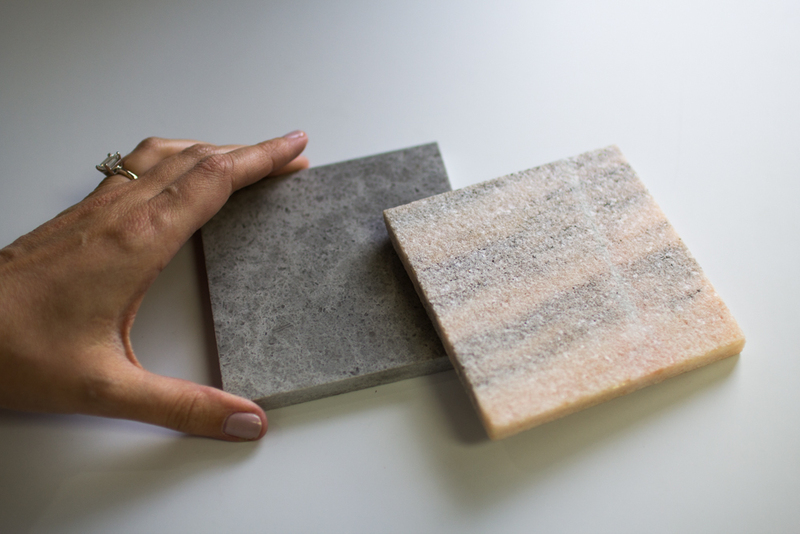 When chatting with like minded designers on Twitter recently, we discovered Polycor and their line of beautiful, natural stones. We immediately jumped at the opportunity to collaborate with them, hence the reason for this blog post! While reviewing my favorite Polycor natural surfaces for an upcoming blog post, “top ten surfaces for a men’s bathroom” , my wife went crazy for the new line. She loved the movement, the veining and the texture of the marble so much that we called Polycor THAT day and placed an order for several samples. When the Etowah marble sample arrived to our office, it didn’t leave her hand all day. I tried to get it back, but Melissa had other plans. “I have an idea!” she said. “How beautiful would this look in a glamorous bachelorette kitchen? It would add such an organic vibe. These are mine now, you will have to get your own!” And with that, an idea was born. So, please join Melissa, myself, and Polycor as we share ideas + a moodboard to help create the perfect kitchen for any sophisticated woman. And don’t forget to scroll down to the bottom of this post to enter to win an exciting giveaway! “When designing a kitchen I will usually start with the hard surfaces, and when you start off with something inspiring the rest of the elements fall into place. 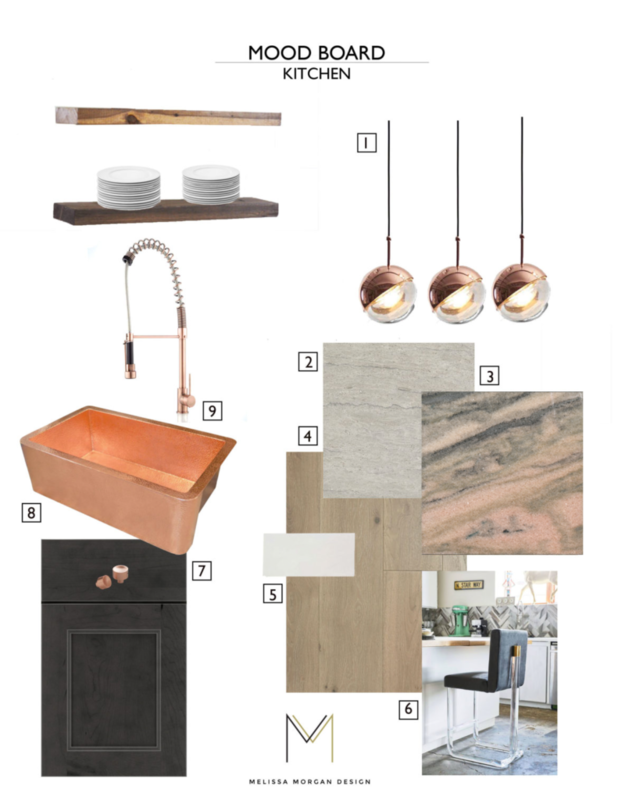 I fell in love with the Marble Etowah, it had such a great texture and the blush color inspired me to design a Bachorlette Kitchen that was glamorous and organic.” says Melissa. Not ready to go just yet? Well, stick around because we’re giving away two of our favorite products from Polycor that you can use right now! Alright, here’s the fun part. 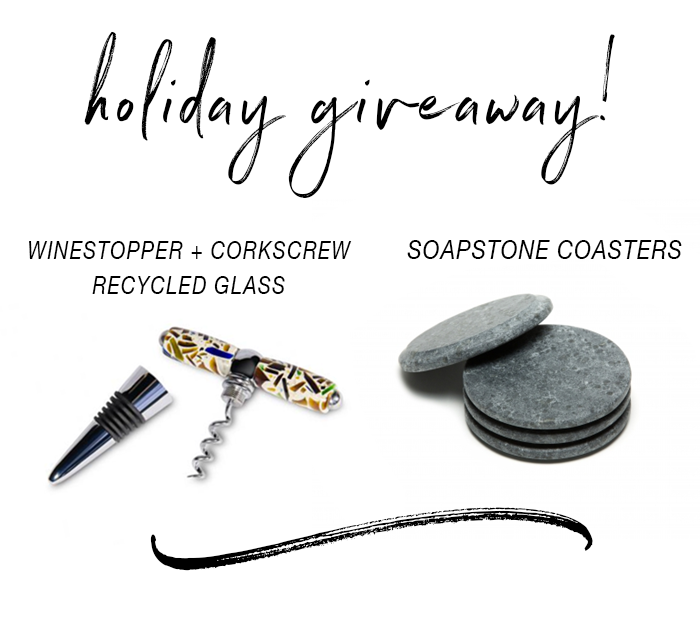 To make your holidays a little more beautiful, we’re giving away this set of coasters and wine stopper/corkscrew to ONE lucky winner. Love your deign Ideas! I work with a fabricating company but i love helping customer design there ideal area!